Just about everyone everywhere has been buzzing about the “Late Night TV War” between Conan O’Brien, Jay Leno, & David Letterman. If you’ve been living under a rock & don’t know what’s going on, long story short, NBC wanted to move Late Night with Conan O’Brien to a 12:05 AM time slot & move Jay Leno back to 11:35 PM to compete with David Letterman. O’Brien was given only 7 months to establish himself to go against Letterman. He started strong, then proceeded to drop in the ratings game once Letterman decided to make a snide comment about Sarah Palin’s daughter; Letterman’s ratings went way up after that. NBC seems to feel they’d have better luck putting Leno back in his spot & then Conan after Leno. In doing so, NBC has managed to anger the loyal fanbase now known as “Team Coco” as well as O’Brien himself. In fact, it’s gotten to the point where O’Brien is openly tearing NBC a new one on his program & NBC is considering paying him between $30 – $40 million to walk with the ability to host his own late night program on a different network again in the fall. Enter WWE. The weekly guest host gimmick has been, for the most part, successful for the company. And as we all know, just about anything serious in the real world or anything involving the world of entertainment is easily spoofed in the world of pro wrestling. Remember the Donald Trump/Rosie O’Donnell war, the match between “Barack Obama” & “Hillary Clinton”, the battle for the Staples Center, or even the Billionaire Ted skits of old? If Raw was hosted by O’Brien, there are ton of ways it could go. Bring in Andy Richter and some of Conan’s band too. Play the show’s theme music & bring out some of what makes Conan’s old and new shows funny (In the Year 2000, staring contests, the Gaseous Weiner [imagine that with DX], etc.) Heck; you could have Conan O’Brien refereeing a match between “Jay Leno” & “David Letterman”. 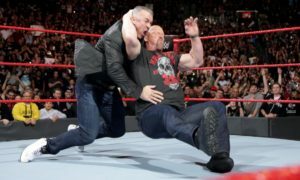 If the deal can be done, WWE stands to gain in the ratings for that episode; many of O’Brien’s fans will follow him to see his antics in WWE for one night, especially if a new show on a different network is a possibility. 1. Would WWE risk jeopardizing it’s relationship with NBC if they wanted to bring back Saturday Night’s Main Event again? Conan revealed the other night that he cannot talk badly about NBC as part of his buyout from the network (but he could sing about it). This could place limits on the creative team on how do write out the show. However, since parody is commonplace in the wrestling industry & is something you really cannot be sued successfully over (i.e. WCW suing ECW for the bWo parody of the nWo), it is possible to still put on an entertaining show. 2. The rights to some element’s of Conan’s show are rumored to be up in the air as well. If O’Brien was to host Raw & to make the program feel like his, it would be odd not seeing things/characters like Triumph the Insult Comic Hound. If a deal can be worked out between the two that would not damage WWE’s relationship with WWE, I honestly think O’Brien could be the best Raw host since Bob Barker.